DigVentures is on the hunt for Princess Aebbe’s missing Anglo-Saxon monastery. But how will we know when we’ve found it? And if we do, how will we know that the buildings are Anglo-Saxon, rather than medieval? When you picture a monastery, what you see is probably medieval; all cloisters, gatehouses and soaring masonry. But they weren’t always like that. In fact, there are several important differences between the UK’s earliest monasteries, and those that were built in the later medieval period. Coldingham is a perfect example. Today, you can still visit and see the ruins of a priory that was established in the 11th century. But the ones we’re looking for are much, much older; they were built by an Anglo-Saxon princess named Aebbe 500 years before it. Originally founded in AD 640, Aebbe had been educated at Iona in the Irish tradition. 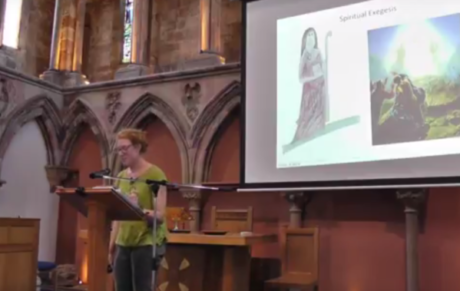 When she returned to Northumbria, she brought Christianity with her, and her monastery at Coldingham quickly became an epicentre from which Christianity spread among the population of Northumbria, who were then still largely pagan. It eventually burned down in AD 683, and although a handful of nuns clung on and resisted several Viking invasions, it was eventually abandoned and then re-established by Edgar, King of Scots, in the 11th century. In the intervening years, religion and monasticism changed drastically, and so did the architecture that went with it. While medieval monasteries tend to be compact, stone-built and laid out according to a pretty standardised ground-plan, Anglo-Saxon ones were more spread out, often built of wood (at least initially), and did not conform to any kind of rigid ground plan – its constituent buildings could be almost anywhere within the monastery bounds. 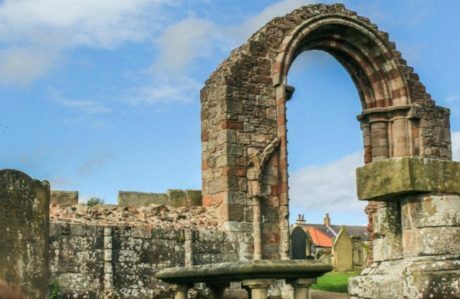 DigVentures’ crowdfunded excavation is all set to try and locate Coldingham’s original monastery, but it will be a very different task to looking for a Medieval one. Here’s why. Cloisters are the architectural manifestation of the theological concept of ‘enclaustration’ (withdrawing from the world to worship) and probably one of the first things you think of when you picture a monastery. 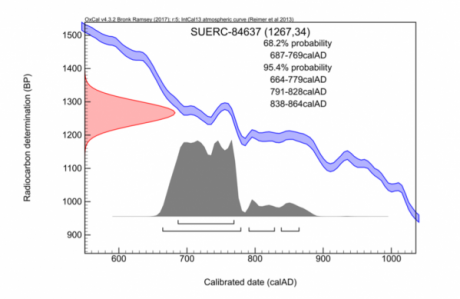 And yet the earliest examples don’t appear until the end of the 8th century in Carolingian Francia at places like Lorsch, or until the 9th century in places like Inden in Germany and St Wandrille in Normandy. In England, they don’t seem to have arrived until the Saxo-Norman revival of monasticism in the late 10th and 11th centuries, although no one seems to know exactly where the first one was – if you have the answer to this, please do let us know! Rather than having cloisters to shut them off from the world, the boundaries of earlier monasteries, like Iona, Lindisfarne and even Lyminge, were more often defined by natural features in the landscape – islands, headlands and river bends were all popular, and they all brought the added benefit of access to the ‘whale roads’ of contemporary writing. Hilltops were also common, literally raising the monastery above the day-to-day world – as at recently excavated Lyminge, Kent, which was located on the end of a chalk spur overlooking a natural spring. The case of Lindisfarne is also a classic, combining a coastal island location, and a headland on the island defining three sides of the site; finding the fourth boundary feature would be a wonderful discovery. Overall the early monastic settlements were more varied and dispersed in layout, and often spread out over much larger areas of land than later ones. Within, there would usually have been more open ground than one might expect, with buildings spaced some distance apart, and inner zones for worship, habitation and light industry divided by earthwork boundaries. The majority of buildings at most monasteries were built using timber until after the Norman Conquest and it was often the church that was built in stone first, as at Lindisfarne and at Lyminge. However, hard evidence for the structures and layout of Saxon and Norman monasteries in England is still limited and all future clues will be important. In the AD 600s, the big question facing the Church in England was whether to retain the native Celtic church or move towards Rome. At the synod of Whitby in AD 664, the pendulum swung decisively toward Rome. Monasteries like Lindisfarne, which had been established in the Celtic tradition, found themselves on the front line. From this point onwards, Roman and Benedictine ideas spread rapidly. St Benedict had laid down his regula (rule) for monastic life in sometime between AD 480-547. The structures and rhythm of the Rule undoubtedly influenced monastic architecture in the centuries to come, accommodating the communal prayer eight times daily with dormitory buildings directly connected to the church, for example. It was still another few hundred years until we can see recognisable Benedictine rule being applied in England around the 10th and 11th centuries, or for the other monastic orders familiar from the high Medieval period to arrive. By the end of the 13th century, as well as Benedictines there were Cluniacs, Carthusians, Cistertians, Augustinians, Premonstratensians, and Gilbertines in England – and that is not including the Orders of friars, the Dominicans (Blackfriars), Fransiscans (Greyfriars) and Carmelites (Whitefriars). Monasticism in the high Medieval period was more regulated, and more complicated. Double monasteries of monks and nuns were much more common in the Anglo-Saxon period than later, as were Abbesses leading them. Hilda at Whitby is a famous example, as is Queen Ethelburga of Kent at Lyminge. Overall, women had a more equal and obvious presence than later. In the case of Lindisfarne, a number of female gravestones, including one for a woman called Osgyth, have been found. Who these women were and the nature of their place in the community is currently still a mystery. The key differences notwithstanding, many features of later Medieval monasteries were present in an earlier, simpler or smaller-scale form in Anglo-Saxon monasteries. For example, early stained glass windows appeared at some of the richest monasteries, such as Jarrow in Northumbria, although they were much smaller than later on, with no firm evidence for pictorial designs. Likewise, the habits worn by monks (tunics and scapulae of undyed wool in the Anglo-Saxon period) and hair styles (Roman-style tonsured hair) changed little; the relative wealth and luxuries (wine, precious metal plate, silks, spices, pigments), the libraries and scriptoria, and the focus on hospitality and agriculture as well as worship.